My younger son mentioned that he wanted to attend BaconFest a while back, and guess what? I came upon a request for volunteers and voila! My two sons and I were in to the celebration as goody bag attendants. It was all bacon, all the time. Bacon Fest reminded me of Taste of Chicago. Except all the food was bacon. Bacon ice cream, gelato, margaritas, doughtnuts, other food, as well as JUST PLAIN BACON. Bacon smoked with pecan, apple, hickory, you get the idea. There was also a bacon eating contest — eat the most in three minutes and you win, a bacon queen, and bacon song and cheer. And plenty of bacon fashion. And bad fashion. And zombies. There were so many bad fashion examples that we couldn’t snap them all. Additionally, we couldn’t snap them inconspicuously a la People of WalMart. We did get a few permissions, but the place was so crowded and loud that it was just too much work (live music galore), so we chilled out and enjoyed ourselves between customers. This is my entry into Project 52 for Max and Darcy. For Max’s challenge, I chose a year-long theme of my kitchen table, and today, Bacon Fest was my table. For Darcy, the week’s theme was True Love, and this day was a great expression of it. Usually my boys are with their dad doing Boy Scout stuff. I don’t get to spend the same kind of time with them doing stuff. So while I wouldn’t normally attend an event like this, I would do it in order to have memorable time with my sons. 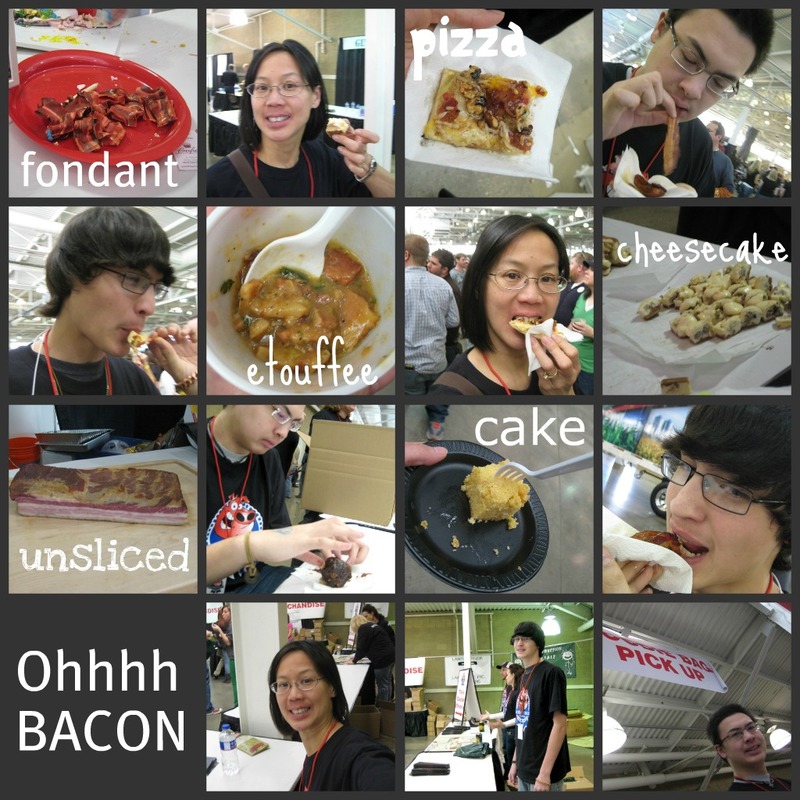 This entry was posted in food, photography and tagged bacon fest, p52. Bookmark the permalink. BaconFest. Oh my. My husband and sons would love that. Sounds like a lot of fun. My oldest son ordered bacon chocolate online. It did taste pretty good. Weird, but, good. Lots of fun to read about your day. I should also note that the food was free with admission. That part is different than Taste of Chicago.